You’d want your kids to figure out their lives all by themselves. But you’ll never really allow that to happen because this world’s not the safest bet. Let’s just say KidZania understands that. What else could have inspired a whole cityscape, resized to a child’s scale, which is real, effective, and informative but at zero risk. To good to be true? Well, read on. A whole city customised for children, like a fairy land, except it’s so close to reality that you might feel delusional for a bit. 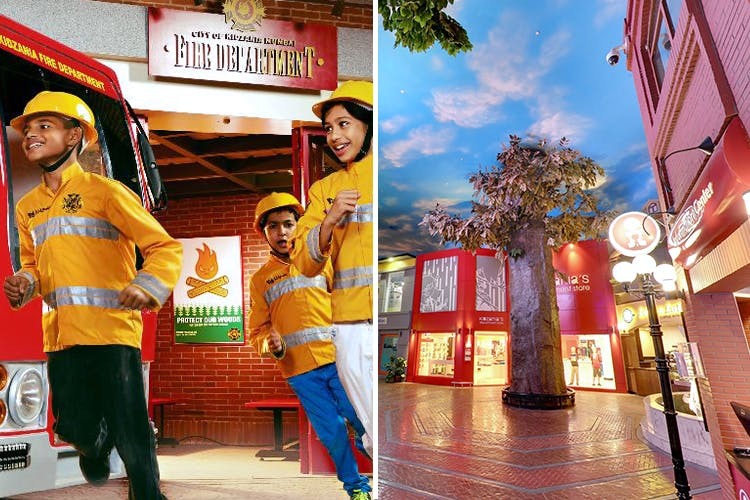 The KidZania in Ghatkopar, a two-floor sprawling area, has every city thing that your child must know about. A chocolate factory, a supermarket, and driving streets. From a medical emergency room, to offices of community helpers (fire-brigade, dabbawallahs, police, security), to an airline ticketing counter, to a TV studio, painting studio, fashion studio, spas, eateries…phew! All designed to give your child a first-hand experience of everything; practical learning. Let your child wander into the dental clinic, and they will have their fair share of handling dental equipment (dummy versions, of course). Let them enter the fire brigade and they’ll love wearing the uniform. They’ll get to observe how a policemen works. How a baker bakes. How one learns to drive. With over 100 interactive spaces. KidZania is every parent’s dream realised where your child is handled with care, but is taught everything there is to learn. The tickets range from INR 300 to INR 1,500. They also have a summer pass, valid for five visits, for INR 2,800. Let your child free and watch them have a time of their life. A perfect weekend activity that makes sure your is learning on the go without wasting any time. Don’t be surprised if you suddenly get to see better grades.